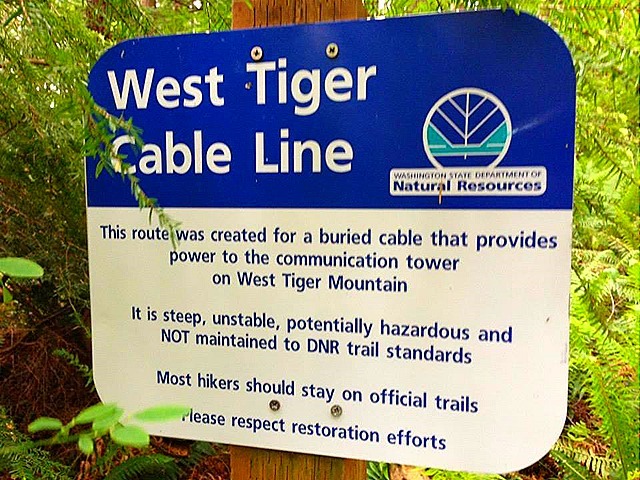 Tiger mountain in Issaquah area is a maze of trails, one of the most challenging ones is cable line hike to Tiger summit #2. This hike is HARD, word written in bold says it all. 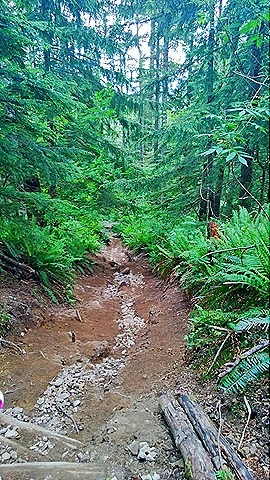 This is not a official WTA hiking path but a path formed of buried cable line that provides power to cell towers on top of tiger mountain. Huffing and puffing for an hour and 30 minutes, I reached the summit. Took in views of tiger surroundings and headed back via regular gentler TMT trail. June has brought warmth and few showers. There are more sunny days around, days are much longer. 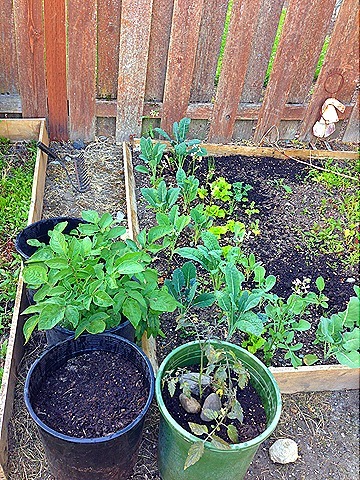 Here is photo of Bed 1 (morning sun) – I am growing Walla Walla sweet onions, these tend to get big. Onions are now rooted and getting bigger. Walla walls are long day type onions, Long-day onions, on the other hand, begin to form a bulb when the day length is between 14 and 16 hours. 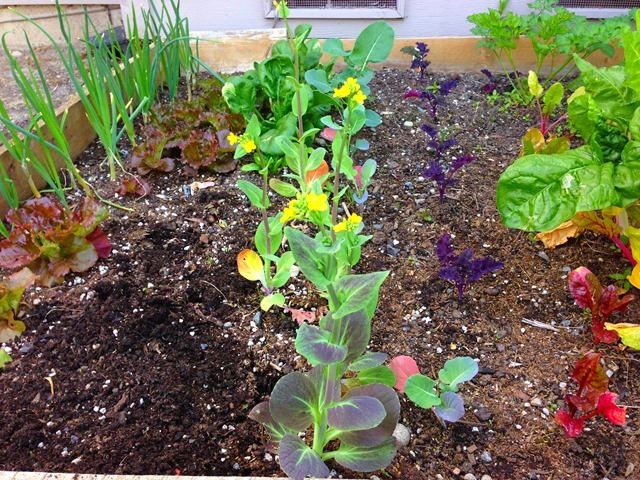 I grew spring spinach in a bed with morning sun (bed 1) and this one. 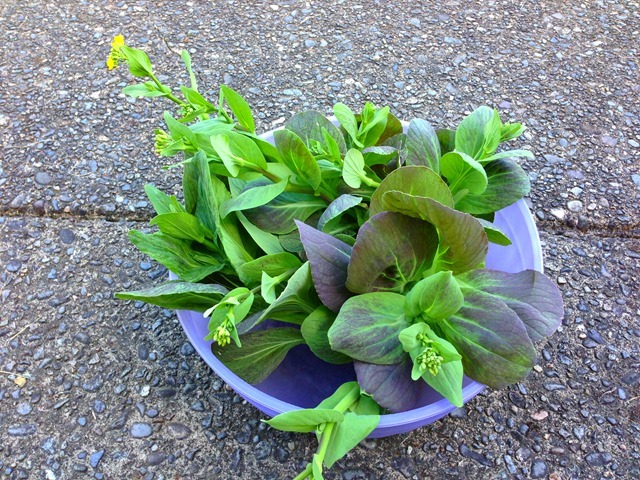 Spinach did not grow big here in full sun, it was pulled. From next year, I’ll grow spinach in shade. 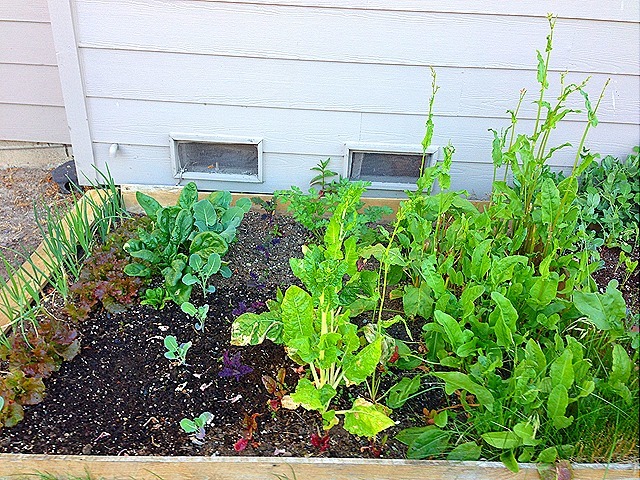 This bed has various kale, arugula, lettuce, peas, beets and carrots. 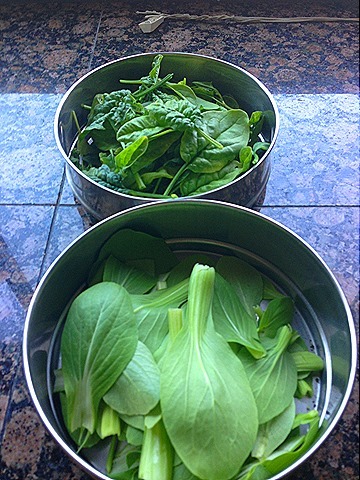 Earlier in Spring, Spinach and bok choy was here. 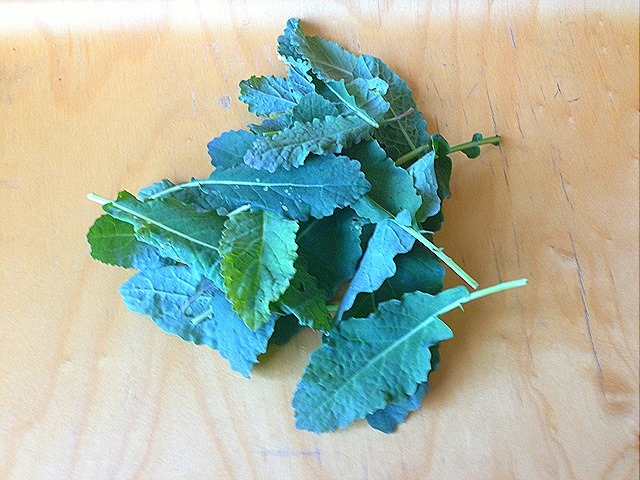 From Left: Lacinto Kale, Arugula. 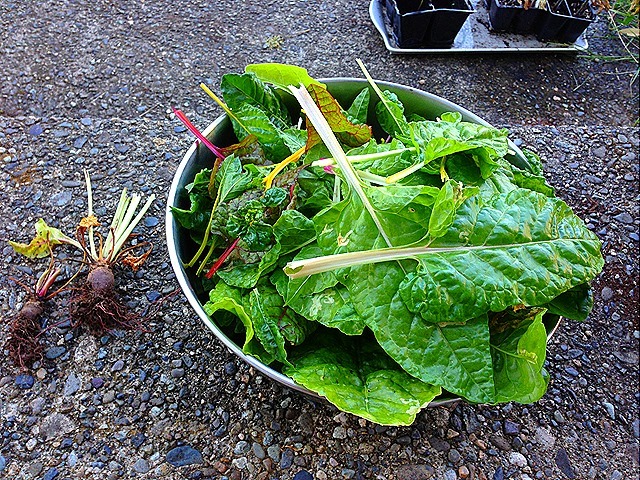 lettuce, beets, tri color carrots and peas. 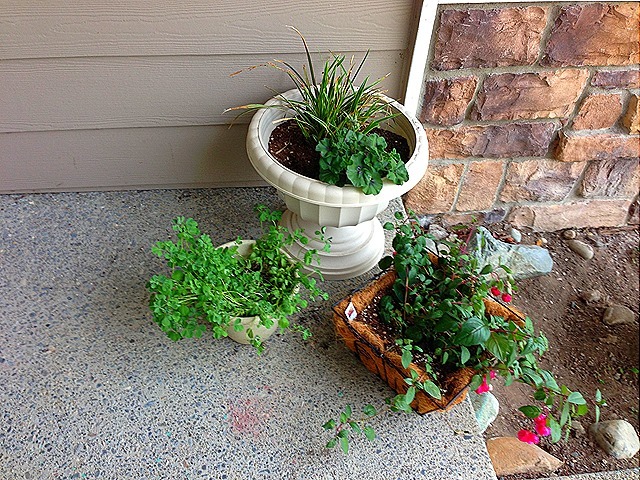 Some pepper plants growing in containers. 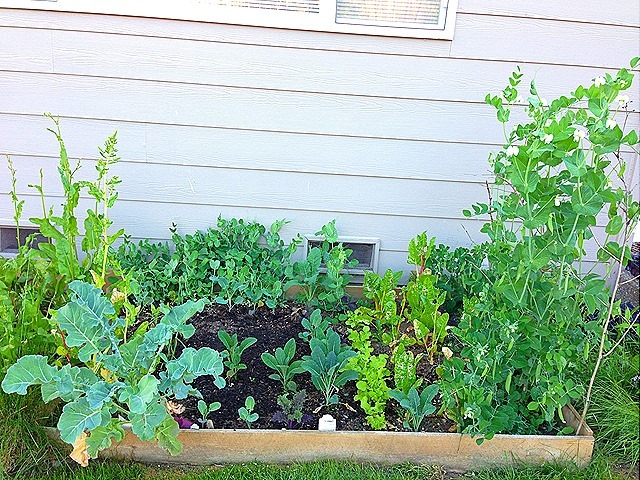 From Left: Sorrel in back and big broccoli plant in front, peas, various kale, lettuce. 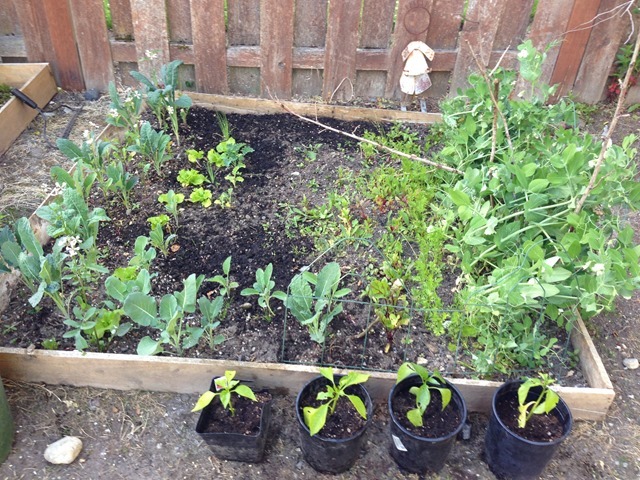 chard and more peas. 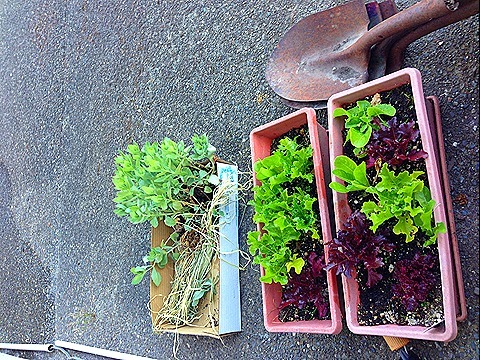 I didn’t venture out in garden (except some photos) except for picking few things here and there. 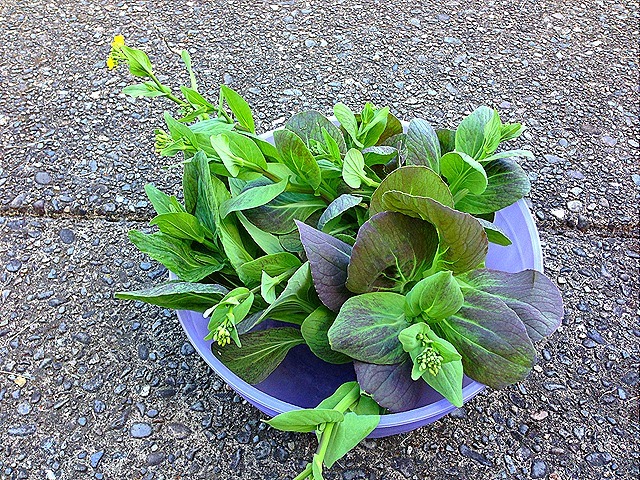 With June warmth, spring greens were bolting and needed harvest. That’s all was gardening work this week. June 2013 week 2 : color! Color is coming to the harvests! 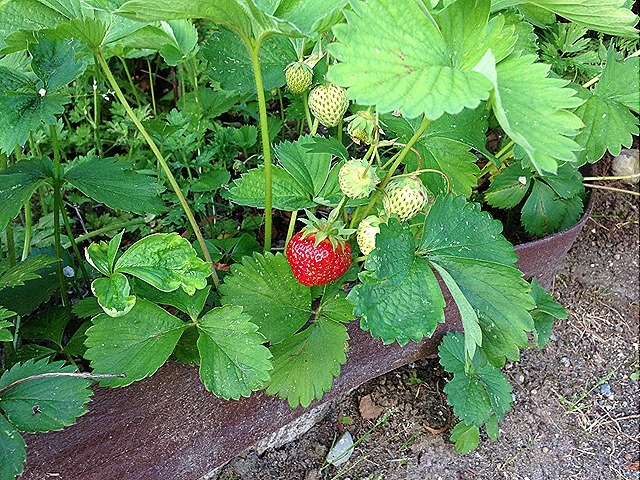 I was getting tired of greens lately.. It’s a lone strawberry this week but it’s a harbinger of more to come. Besides the weekly consumption of Kale and Chard in parathas and smoothies, there are some new additions ready to eat… It’s peas!! The first peas!! 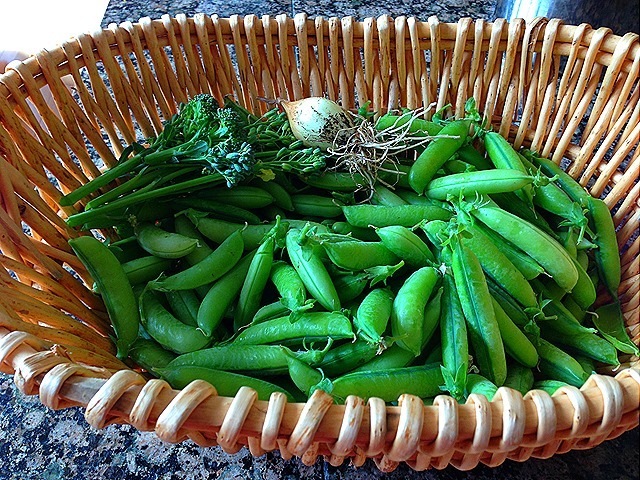 there’s just no time to take photos, there were plenty of snow peas ready to be picked. 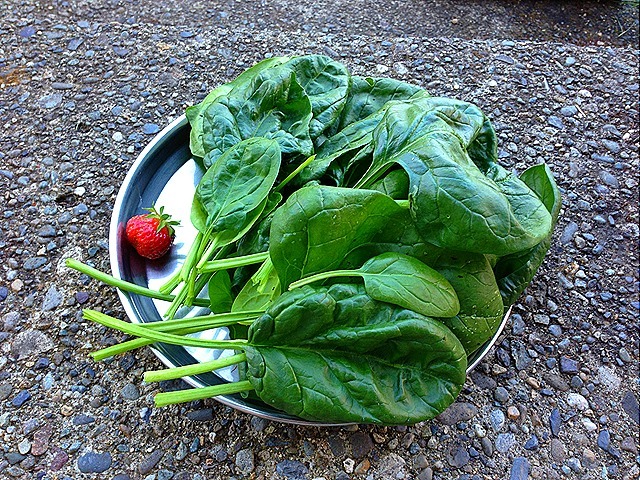 I also picked bunch of spinach and few first strawberries. 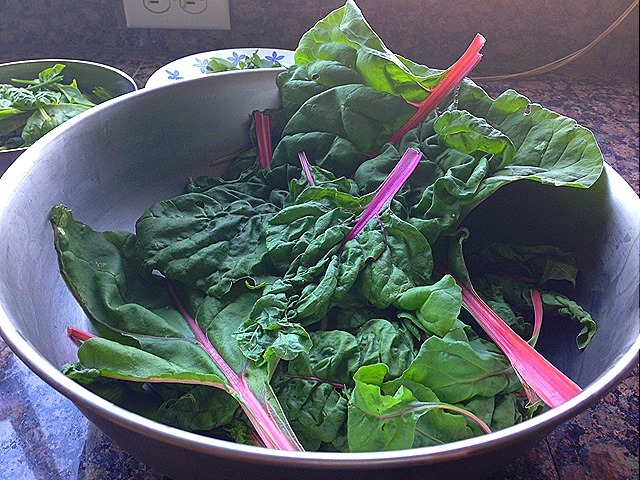 Then there was plenty of chard ready to be picked, I turned these greens into thepalas. Next harvest promises lots of Red, strawberries and raspberries will soon be picked. 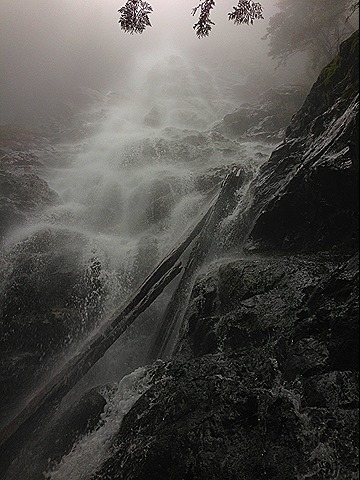 We hiked to Kamikaze falls (also called Tenerife falls) in North Bend last weekend. 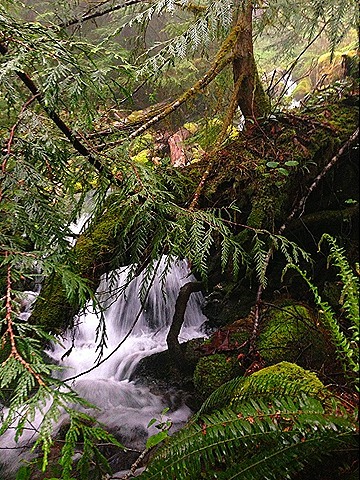 This place is closer to Mount SI but gets fewer visitors as signs are unmarked, parking is limited. 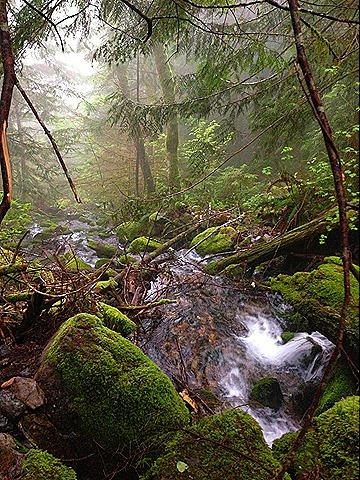 Enjoy this photo tour of hike on misty foggy day. 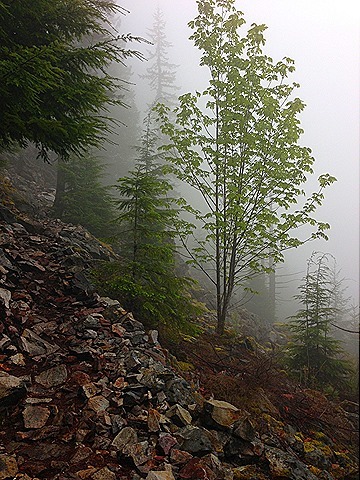 Hike Started out from unmarked school bus turnaround on Mount SI road, it was a misty foggy day. 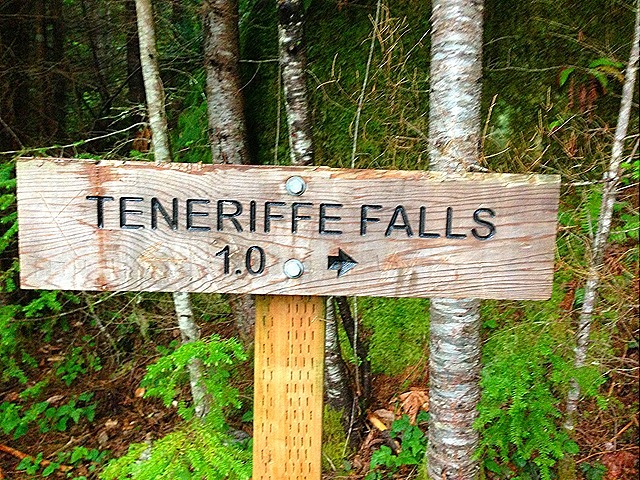 After couple miles of wide gentle sloping path, WTA has set up sign to Tenerife falls. Last one mile is steep switchbacks to lower/upper falls. 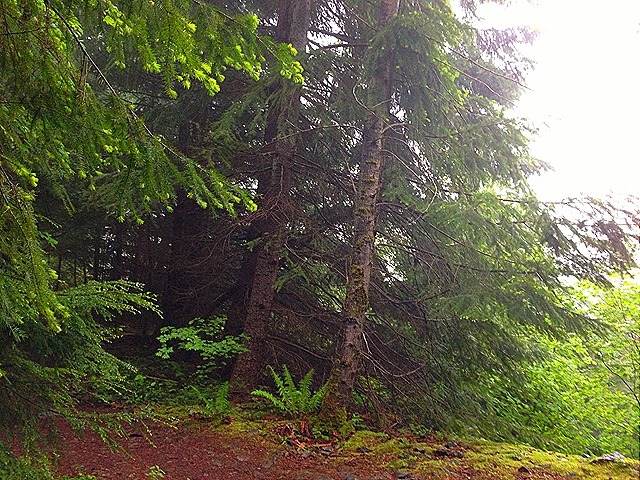 With Rocky trail and 20+ switchbacks, it’s 800 ft gain in just a mile. 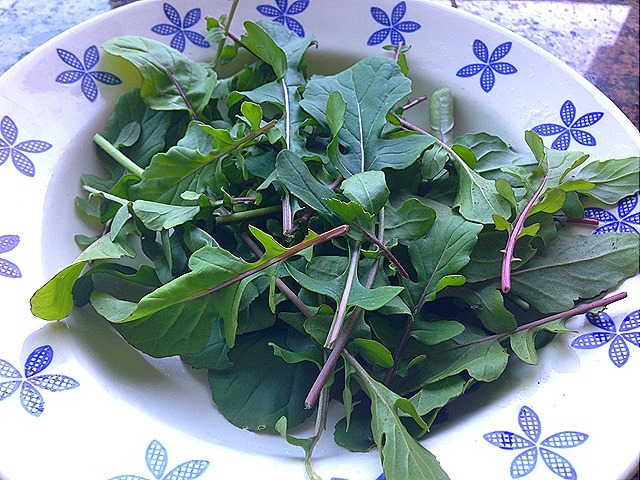 I have 2 kinds of Pak Choy in garden, Red Choy and White Choy. I was about to harvest both but got distracted by something. This is what happens within a day or two, sometime in May, days are longer and temps are warmer, Bok choi produces these wonderful shoots and flowers. I still managed to save some and harvest. Around here we simply sauté with Garlic OR make it into saag (replace mustard greens with bok choy!). 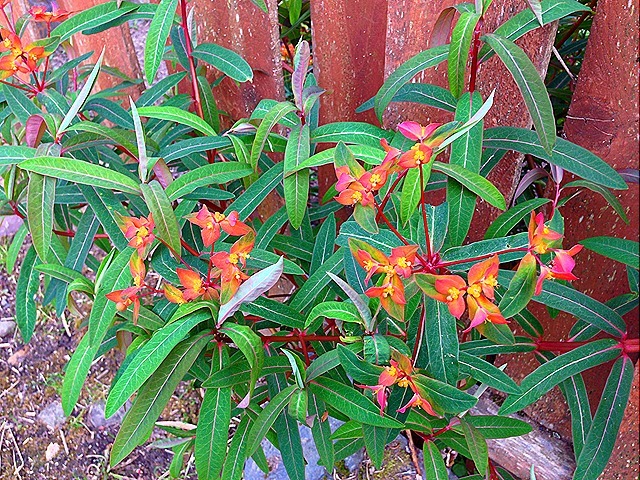 Unknown bloom in my garden, this is a perennial plant, blooms bright orange flowers most spring and summer long. Canes turn red in fall and die down.